The CD features timeless carols as well as modern compositions by Irish composers, and choral pieces that are instantly evocative of the Christmas season. 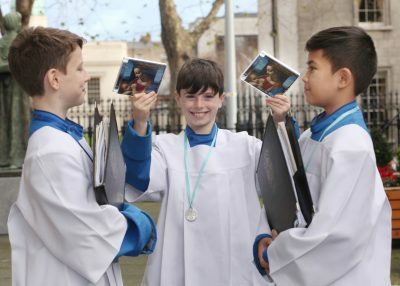 Pic shows Palestrina Choir members Simon Maughan, Oliver Maughan and Charles Vincent Nunala-Maloney with a copy of their latest CD, ‘Joy To The World’. Pic John Mc Elroy. best-loved Christmas carols and choral music spanning almost five centuries. The Palestrina Choir’s latest CD is titled Joy to the World. It was recorded at St Mary’s Pro-Cathedral in Dublin, not only because it is home to the choir but also because of its excellent acoustics. The album features timeless carols such as ‘Silent Night’, ‘The First Noëlle’, ‘Joy to the World’, and ‘Adeste Fideles’, as well as modern compositions by Irish composers, and iconic choral pieces that are instantly evocative of the Christmas season. On Joy to the World the Palestrina Choir, conducted by Blánaid Murphy, is joined by organist David Grealy and Dublin Brass. The CD follows several acclaimed releases in recent years, notably the choir’s most popular disc, The Bells of the Angelus. As part of the festive build-up, the choir is tweeting a carol a day from the new CD for every day of Advent. The release of Joy to the World comes ahead of some important concerts by the Palestrina Choir including its annual Christmas concert on Tuesday 11 December at the National Concert Hall in Dublin. On Tuesday 18 December, the Palestrina Choir will perform Handel’s Messiah at the Pro-Cathedral in Dublin at 8 p.m. along with St Mary’s Pro-Cathedral Girls’ Choir and the Dublin Bach Singers. Soloists are Hannah Gries (Soprano), Alison Browner (Alto), Conor Prendiville (Tenor) and Benjamin Russell (Bass). Conductor Blánaid Murphy will lead the Marlborough Baroque Players. The Palestrina Choir has been part of Ireland’s musical life for over one hundred years and in that time it has earned a distinguished reputation internationally. Prestigious invitations include one from the Vatican to sing at a Mass celebrated by Pope Benedict XVI. The choir has toured extensively throughout the UK, Europe, and the US, performing at Carnegie Hall on their most recent American tour. Spring 2019 will see the choir embark on another US tour to the mid-west states. The Palestrina Choir was founded in 1903. Alumni include Ireland’s legendary tenor, John Count McCormack.